The driving force behind progress in Industrial automation in the last 10 years has without doubt been the networking of automation products via bus systems. The importance of industrial communication within machines and installations is increasing exponentially as networking is decentralised from its starting point – communication at control system level – through to the connection of front-end devices, sensors and actuators. 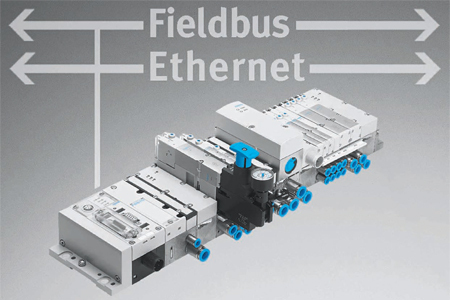 Here Uwe Gräff, Head of Business Unit Netware Interface Control at Festo looks at how fieldbus and ethernet solutions will develop in the future and the move away from pre-processing parameterisation to distributed control intelligence. While in the previous decade attitudes to the use of bus systems were still very critical, today field bus systems are regarded as a vital part of many applications. They are used in more and more areas. Installation-saving solutions with automation devices equipped with a bus connection are state of the art, while in front-end automation a new class of high-performance products is emerging as a next step to greater efficiency and higher availability. This applies in particular to automation with pneumatics and valve terminals. This development is reflected in new trends and increasing acceptance of automation is more critical applications and is leading to pronounced changes in the design of automation components and systems.